and the release was delayed. But this time everything seems to run smoothly, at least on Windows 32 bits. 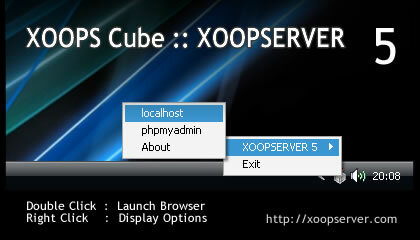 XOOPSERVER 5 Portable WAMP is available to test XOOPS Cube distributions packages and for future improvements. Test XOOPS Cube Legacy Distributions with Xoopserver 5, a portable WAMP - Windows, Apache, MySQL and PHP 5. Click and run a local server from your hard disk or USB device. Experiment and take advantage of XOOPS Cube Legacy Freedom to Create. The Simple, Secure and Scalable modular architecture easy to built with the new D3 Modules generation featuring an intuitive interface to personalize your templates and language catalogs. The 08.08.2008 marked the end of life for PHP 4, which has been in stable release since May, 2000. With eight years of legacy code out there, it is likely that there are going to be a fairly large number of systems that will not migrate to PHP 5 in the near future, and a reasonable proportion of those that will not make the migration at all. And that is also why I'm sure you will enjoy the great work done by developers with Legacy system!